This is hard to work out, cause treacle saying pauls winning but I don't know his returns in here from the other games!! I keep forgetting about this am too busy concentrating on the War Games. I just re-read your comments in the November tips Kelly after all this mallarkey and have to admit, I got it wrong. I thought you said Paul was leading, hence my original comment, so apologies for that. And yes I expect Scram to be up there too. I keep track of mine as well Kelly. You can of course if it is no bother. Otherwise I can post it the results weekly like last week. you can reset mine to 300 if you want but i got 260 you tart i agree with Voodoo unless people are saying it i think you should not count them Henyas scram me nick we all keep writing it down so only us should be allowed in the game leave it up to others to keep record you take on way too much it is no wonder you getting it wrong look at my thread says 1st two written will be counted so is very easy follow how i do on it which is poor at moment Scram Henyas and Nick easy to follow on how they do it. just noticed this one! that is quite a something well done! Thank you everyone yes that will be easier if all keep record for me, i be honest only took a fast look down November thread and think added it up wrong anyway because Voodoo is £90 this month so logic said he must be 900 points but then like someone pointed out to me in PM that is not adding his first two bets so thank you for taking the reset Voodoo just make sure keep track of it for me ok. Thanks Sean that makes yours very easy each month. Well done HenYas on your double today very good return. Scram yes that must be right because your always very honest and have always gave weekly results so yours is right. Thanks Voodoo, you do too so I often follow yours. I see Voodoo is on the 150, so happy days. The 210 is a little info expecting it to do well. You may expect the fav to be hard to beat but hasn't run for a while, so caid will have the edge and with 18lbs in its favour, although some the claimer, I think has a good chance but done ew for a reason. 13/2 in places. Well done Henyas...not been on the thread since Sunday and just noticed your double. Top stuff Sir! Following you on the Lucky. Cottersrock and sanibel were already oin my list and william H might be a useful cover on the New One. If the double goes through that would get the K&Q shaken up properly! @Scram wrote: Following you on the Lucky. Good luck to us both then Scram. I saw you on Cottersrock which boosted my confidence to quote it for a lucky 15. Also doing nicker ew on Lisp which looks interesting and Morney Wing, which I see Nick has tipped too. Oh and Goring One all at Fontwell. Nearing end of month, so all in Each Way if poss? Kelly, could you please tell us what the lead table is like for this game for November? 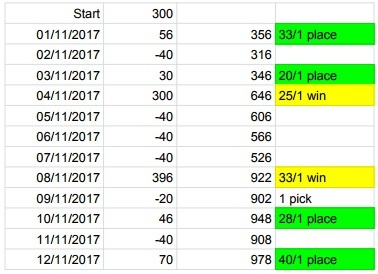 Just to see what needs to happen on the last day, if you have this information easy at hand... My results are on my PC but no idea about the big hitters from the forum..